It’s been a very busy year for me on Lynda.com. Instead of linking every one of my courses individually here, I think it’s better to provide one link to all of my courses on Lynda.com. Click here to see my constantly-growing list of courses. I cover topics like OS X, Windows 10, Android and iOS devices, Microsoft Word, and more. Your comments and questions are welcome here on this site. I just won’t be making a post for every course anymore. Lock your phone! This time on Android. Yes, security is important for you Android smart phone and tablet. Protect your Android device from being stolen, and protect your data from being accessed if your device is stolen. In this course on lynda.com “Android Phone and Tablet Security Fundamentals“, I’ll show you how to keep yourself protected. We’ll talk about locking your device, avoiding malicious apps, locating your device if it’s lost or stolen and so much more. Lock your phone! Seriously. Lock your phone. There is so much private data on your smart phone and tablet that would be so easy to access if somebody was able to steal it. You need to protect your iPhone or iPad from being stolen, but you also need to safeguard your email, photos and app data. My lynda.com course “iPhone and iPad Security Fundamentals” will help you design a strategy for protecting your devices. You can decide what type of passcode or password lock you want, control what can be accessed when your device is locked, and have a plan in place when your device is lost or stolen. There’s much more. You’d be surprised at the potential security risks can result from an unprotected iPhone or iPad. I went to CES 2015 with two other lynda.com authors – Garrick Chow and Jess Stratton. We saw lots of fun technology, toys and gadgets. There were lots of exciting new things and lots of pointless ideas. 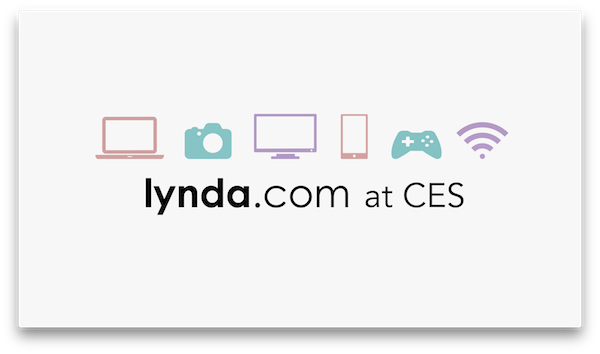 We wrote up some of our favorite finds at CES for the lynda.com Article Center. Check out our first part, written by me for smart credit cards, solar panels and batteries for mobile devices, a great smart watch, and an Android set-top box and gaming system. Part 2 comes from Jess Stratton, featuring home automation solutions and great atmospheric lighting gadgets for the home. In part 3, Garrick Chow talks about fitness trackers, and gadgets that are built from similar technology as fitness trackers. He also looks at more home automation and a wireless smart baby thermometer. It’s great when you have a brand new computer that runs fast and smoothly. But, over time, you’re probably going to start feeling your computer running slower. Is it a problem with the computer? Are you running software that’s too demanding? Is it time to upgrade? Check out my course on lynda.com – Speeding Up and Maintaining your Mac – for some tips on troubleshooting and fixing your speed problems. Is a complete Office suite on a phone even possible? Yes, it is. And it works really well. If you haven’t seen Word, Excel and Powerpoint for iPhone, check out this quick introduction on lynda.com – Office for iPhone First Look. With Apple Pay on iOS 8, you can use your iPhone 6 as a mobile payment system. At participating retailers, you can skip the your credit card and authorize payments directly from your phone. Check out this short set of movies on lynda.com to get Up and Running with Apple Pay. If you’re new to using a Mac, new to OS X Yosemite, or just looking for a deep dive to learn about all of the essential features of Apple’s operating system, be sure to check out my course on lynda.com, Mac OS X Yosemite Essential Training.